The year is 1792. George Washington is re-elected president. France is embroiled in revolutionary upheaval. America’s first Columbus Day celebration takes place in New York City. And Kentucky is admitted as the 15th state. It’s hard to think of bourbon without thinking of Kentucky—or vice versa, for that matter. So it stands to reason that Ridgemont Reserve should commemorate the year the Bluegrass State became official, as long as the spirit in question is up to the task of representing the motherland of bourbon. That’s a tall order. 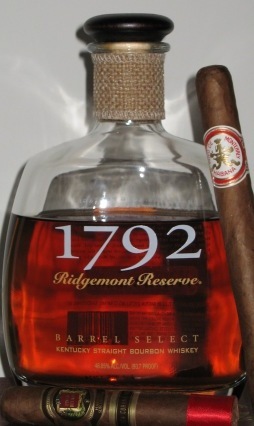 The folks at the Tom Moore Distillery in Bardstown think the 1792 Ridgemont Reserve is up to the task. This 93.7-proof spirit dates back to the 1880s and is crafted in small batches then aged in charred oak barrels. The result, according to the Sazerac Company, is “a distinctively smooth” bourbon that’s honored as the Official Toasting Bourbon of the Kentucky Bourbon Festival. The back of this bourbon’s skinny, oval-shaped bottle features an individually numbered sticker with signatures next to “checked” and “approved.” Glad to see my bottle passed muster. The line next to “character” reads “rich flavor, velvety.” Removing the wooden, cork-stopped cap, the spirit pours with a bright copper hue with orange peel, charred oak, honey, and caramel on the nose. Light and sweet without an alcohol tinge. The flavor is dry with a medium profile that’s concentrated on the roof of the mouth. Notes of butterscotch, salty corn, wood, and rustic spice are most dominant. An ice cube or two helps round out the taste and tone down the finish, which is characterized by spicy rye. The straightforward flavor may not be as balanced or complex as I had expected given its pre-sip aroma, but the Ridgemont Reserve still packs plenty of enjoyment for a wallet-friendly price. Only $25-30 per 750 ml. bottle gets you a decent sipping bourbon that pairs well with most medium-bodied cigars. While it may not be the best Kentucky has to offer, 1792 is an honest, cost-effective choice for bourbon enthusiasts on a budget. At that price I'll take Evan Williams Single Barrel over 1792 anytime. I, too, prefer the Evan Williams Single Barrel. I wrote about the Vintage 1998 last summer and gave it a glowing review. While the 1792 isn't as impressive, I will pick it up from time to time if I want something affordable but a little off the beaten path. Variety can be nice.